Have we all forgotten what Disneyland was originally about? I was wandering around Disneyland a few weeks ago, thinking about the fact that it’s now fifty years old. There’s still a lot to admire about the place. It’s still clean, still fun, and still has a lot of the same enjoyments that attracted me as a kid. I always wonder whether it’s something quirky about me that makes me love Disneyland so much, but when I take someone who hasn’t visited in a long while I know that it’s not. Though they’re unlikely to take it to my extremes—visiting at every opportunity, studying every nook and cranny—it’s obvious that they feel the same excitement that I do, and it’s reassuring. Yet when I visit now, something is missing. It’s possible that the “something” is my youth; as much as I enjoy Disneyland now, there’s no way it can compare to what it felt like when I was ten. I think it’s more than that, though: I’m missing the sense that Disneyland is trying to tell a story, that it’s “about” something. Hold onto this thought while I digress for a moment. Is it possible to build a Disneyland outside of America? I know I’m twenty-five years too late in asking this question, but humor me. What I mean is, is it possible to build a Disneyland outside of the U.S. and not fundamentally change what it’s about? Now read it again. If you’re not shocked by it, you probably should be. “Disneyland,” it says, “is dedicated to the ideals, the dreams, and the hard facts that have created America.” But isn’t Disneyland dedicated to making children happy, to providing families with wholesome entertainment? Not really: “joy,” mentioned not until the very end, is a hoped-for side effect, not the goal. According to its dedication, Disneyland is about teaching Walt Disney’s vision of America, and it’s indoctrinated multiple generations of fans—myself included—into its message of progress, enterprise, and freedom. As a propaganda tool, you really can’t overstate how radical Disneyland is underneath its “Happiest Place on Earth” wrapping. To all who come to this happy place, welcome. Here you will discover enchanted lands of Fantasy and Adventure, Yesterday and Tomorrow. May Tokyo Disneyland be an eternal source of joy, laughter, inspiration, and imagination to the peoples of the world. And may this magical kingdom be an enduring symbol of the spirit of cooperation and friendship between the great nations of Japan and the United States of America. To all who come to this happy place, welcome. Once upon a time a master storyteller, Walt Disney, inspired by Europe’s best loved tales, used his own special gifts to share them with the world. He envisioned a Magic Kingdom where these stories would come to life and called it Disneyland. Now his dream returns to the land that inspired it. Euro Disneyland is dedicated to the young and the young at heart, with the hope that it will be a source of joy and inspiration for all the world. Neither of these resembles the Disneyland dedication. In Tokyo, the park is intended to be both a source of happiness and a sort of “ambassador” between our two countries. In France it’s even simpler: the Paris park is a source of happiness, nothing more. Though all of these Magic Kingdoms around the world look superficially like each other, at their heart they’re very different places. Their goals are different. The change is most obvious at a place like Hong Kong Disneyland. (For those curious, Hong Kong’s dedication reads like a combination of Tokyo and Paris.) Hong Kong’s Main Street is built identically to Disneyland’s. The original Main Street, with its gas lamps and early motor cars, was a tribute to small town America built from the bits and pieces of its designers’ memories. But by “copying the copy” in Hong Kong, the meaning of the place is decidedly different. Hong Kong’s Main Street ends up being a tribute less to small town America than to Disneyland itself. The same kinds of change are evident elsewhere in the park. Instead of trumpeting progress through technology, Hong Kong’s Tomorrowland, though beautiful, has a far simpler goal: it’s “Fantasyland in Space.” It turns out that those dedication plaques aren’t just words: Hong Kong Disneyland (along with Paris and Tokyo) isn’t selling the original Disneyland message; it’s just trying to make people happy, plain and simple. In saying that the new Disneylands aren’t faithful to the original dream, I’m implicitly suggesting that that the original Disneyland is. Yet as I mentioned earlier, something has changed, and it is this: Disneyland itself no longer bothers to tie its attractions back into the core story of the place. Though the park is still charming and fun, it doesn’t resonate the way it used to. Over at the other American park, Disney World, Main Street doesn’t tell much of a story anymore; it’s morphed into a huge gift shop. Even the side streets have been enclosed, betraying a casino-like fear that someone who accidentally wandered out of the shopping complex might not wander back in. The beautiful penny arcade with its classic movieolas and baseball machines is gone. So is the Walt Disney Story and the silent movie theater showing round-the-clock 1920s-era Mickey cartoons. Anaheim’s Tomorrowland has forgotten its story, too: the message of progress is only weakly evident in the lousy Innoventions technology exhibits. The original Space Mountain tied heavily into the NASA legend when it opened; the new Space Mountain is strictly sci-fi, as is the new Buzz Lightyear ride. Back to the earlier question: since none of the Disney parks are adhering to Disneyland’s original goals, are they still worthwhile? As anyone who visits any of these parks can attest, of course, they are. They’re still fun, beautiful, and a source of happiness for millions of people. But there’s no denying that the original inspiration has disappeared. At the foreign parks it’s been tossed aside in favor of simpler, easier-to-digest goals; in Anaheim it’s simply been swept under the rug. Disneyland—and Disney World as well—was built because Walt Disney wanted to see it built. There was something he wanted to communicate to his audience that he couldn’t accomplish with his movies, live-action or animated. While in no way denigrating the efforts of the people who build and maintain today’s Disneylands (which are, to be sure, in many ways superior to the originals that opened in 1955 and 1971), at their core, the parks are now about selling the brand more than enacting a personal vision. During my recent Disneyland visit I saw the refurbished Tiki Room for the first time since its re-opening in March. It was great: everything worked like it was supposed to, and best of all, parts of the show were truly enjoyable. But even though the Tiki Room looks the same, it’s not the place that I grew up with. That Tiki Room was a glimpse into the larger plans that Walt Disney had brewing for the future. In contrast, the Tiki Room today is a museum piece. It’s kept open to keep the original spirit of the place alive, and it works, but only to a point. Over on the other side of the park there are rumors that the PeopleMovers will once again travel around Tomorrowland, and I hope the rumors are true. But I’m not sure what role the PeopleMovers will play in a Tomorrowland that doesn’t mean what it used to. Like the technology of the Tiki Room, the original PeopleMovers were a stepping stone to something better and bolder. Today, both attractions seem like dead-ends. It would be one thing if there were a new story to be told: maybe the original Disneyland story really is antiquated and needs an update. But updated to what? It’s not clear what the new story should be, and as of yet the Disney Company hasn’t supplied us with a replacement. In his first decade, Michael Eisner was perhaps on the road to providing one, with his ambitious expansion plans and love of bold architecture, only to lose it in the confusion of his succeeding years. Will Robert Iger—or someone he hires—figure out the new Disneyland story? Hard to say, but I hope so. The Disney parks are great, but they could be better still. Note: This Disney article first appeared on LaughingPlace.com, where I’m a semi-regular columnist. Have you read Travels in Hyperreality by Umberto Eco? He has a great essay on what it means for cultures to create environmental copies. I think you will enjoy it. I was a Cast Member at WDW in different capacities from 1995-2003 and it is interesting to see the changes taking place around the park. I grew up going to Disneyland and learning as much about the park as I could. I have been to Disneyland Paris and hope to make it to Tokyo, Hong Kong and wherever else a theme park is built. I can relate to your feelings and have my own dissapointments with how things are going. It’s not too late to restore the greatness to the parks, but much of the charm has been compromised for the sake of profit. It’s nice to know there are other people out there that care about the meaning of Disney, not just the name. No, I haven’t read ‘Travels in Hyperreality’. I’ll have to take a look at it! Wow. That sums up what I’ve not been able to put my finger on lately. You are brilliant. I was trying to explain to some fellow fans the other day, what intangible thing is missing in Paris (I went just a few weeks ago). I couldn’t describe it…but you have. Although there are some cool things to see there in Paris, I still felt like something was really missing. Even here in my own Magic Kingdom (I live in Orlando and worked there from 86-96), some things really bother me. I love the park…BUT: Isn’t Tomorrowland getting a little too “cute” and “kiddie”? It is sooooo far from what it once was. Even some of the first wave of new stuff is already lost…Did they really need to revamp Alien Encounter to add in Stitch? “Alien” was an original and edgy addition. I really liked it a lot! It was actually thrilling…but above all (again), original! All to sell merchandise! I know that selling plush in the parks makes the company great profits. But it is like this…if you only eat candy (easy,charcter tie-ins), you get cavities and a stomach ache. You need a hearty filling, meaty meal to be healthy. This is what the Kingdoms have been missing lately. Big, meaty,(original) attractions. Don’t even get me started on the new Pooh play area that sits where 20K used to be. Can’t I get the same experience at any McDonald’s PlayPlace? I bring my kid to Disney for original experiences. I have it on good authority from an insider friend who still works in MK management, that this low cost area was designed to entice kids to want to take home plush versions of the Pooh charcters from the very nearby shop. Parents are supposed to get nostalgic about their own Pooh childhood memories and buy plush for the kids a few steps away. Hey, No crime in making money (Disney is great at it..thank heaven for us fans!) but to have that as the point of inspration for an addition to the park is wrong. The same man who oversaw the develpment of this palyground area is also responsible for enclosing the West side of center street on Main Street. It is so sad …all of the great facades and lovely and quiet space we lost by that decision. Good news is that he has left the company. He was known as Mr. Plush by those around him. Yeesh! I’m heaving now! I can only hope that some of the budget and ingenuity that made Disney Sea in Tokyo possible will find it’s way home to bless our 2 beloved American Kingdoms. Thank you for sharing your insight and allowing me to share my feelings! Your comments are right on target, and tinged with a melancholy which many people feel. Hopefully Mr. Iger, whose field is technology, will be wise enough to hire real artists with heart (you among them?) and let them work for excellence rather than money. the plan to inject the Disney film characters into IT’S A SMALL WORLD is such a glaring miscalculation that the disappointment many Disney bloggers feel may boil over into public resentment. I love your article and agree with most of it whole heartedly. Yes we have progressed with technology and some of the older attractions seem outdated however they are not outdated to all the new young children who explore through the parks daily. For example the adventure through inner space ride taught basic biology concepts. I personally would love to see it return. The people mover could incorporate advance science such as the human genome project and be completely educational. As for the Tiki Room I don’t think it is a dead end at all. Where else can young children sit and listen to birds and tiki totems come alive and a tropical rainstorm to boot! It is wonderful. Yes new technology is great but reviving the basics can still be entertaining if done properly. For example bring back the Mary Blair tiles in tomorrowland. Education needs to be brought back to the park to continue the “charm”. If it continues on it’s current path as one big advertisment for Disney movies what is the point. Too much commercialism gets really boring after awhile. To all who come to this happy place: welcome. Disneyland is your land. Here age relives fond memories of the past (main street, New Orleans Square), and here youth may savor the challenge and promise of the future (Tomorrowland). 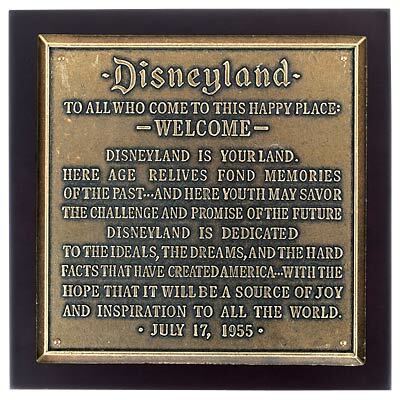 Disneyland is dedicated to the ideals (Tomorrowland), the dreams (Fantasyland), and the hard facts (Frontierland, Adventureland) that have created America, with the hope that it will be a source of joy and inspiration to all the world. EXACTLY WHY DO YOU NOT UNDERSTAND THIS?